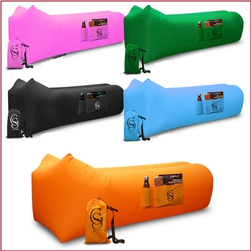 Inflatable Lounge Chairs imprinted with your business, school, or event logo are the perfect prize giveaway items or fundraising product. These fun chairs can hold up to 420lbs and are a colorful way to promote your event function or gathering. Kids love lounging in these fun inflatable bags! Great for concerts in the park, watching fireworks, festivals, outdoor movies, and so much more. Includes drink and magazine pockets, carry bag, and can be filled up by simply holding the bag up and walking (to fill with wind).